Last post introduced the hypothesis that having more metaphors equips people to innovate, because it expands their set of tools for thinking about novel settings. It presented some reasons to think this is true. This post pushes back on that simplistic hypothesis. Having the right metaphor is only half the battle; you also have to find it. This is an interesting idea tossed out by David Wootton in The Invention of Science. Wootton suggests this formed a sort of reasoning trap. Every potential metaphor had so much baggage in the form of irrelevant features that it became hard to use them well. I think the use of metaphors in alchemy provides a good illustration of this phenomena. Gentner and Jeziorski (1990) compare the use of metaphor/analogy in alchemy (prior to 1550) and chemistry (post 1600s). Compared to chemistry, alchemy seems to be endlessly led astray by metaphors chosen on the basis of red herring associations. 2. The shell of the egg is an element like earth, cold and dry; it has been called copper, iron, tin, lead. The white of the egg is the water divine, the yellow of the egg is couperose [sulfate], the oily portion is fire. 3. The egg has been called the seed and its shell the skin; its white and its yellow the flesh, its oily part, the soul, its aqueous, the breath or the air. Gentner and Jeziorski contrast this style of thinking with the use of metaphor/analogy by later chemists. For example, Robert Boyle, trying to illustrate how individually minute effects can have large-scale effects in aggregate, uses metaphors of ants moving a heap of eggs and wind tugging on the leaves and twigs of a branch until it snaps off (Gentner and Jeziorski p. 8). Sadi Carnot uses the metaphor of water falling through a waterfall to understand the flow of heat through an engine. What’s interesting is that neither Boyle nor Carnot used a novel metaphors that had been unavailable to the alchemists (although the math associated with Carnot’s model was new). It wasn’t that the availability of new metaphors that differentiated chemists from alchemists. It was the selection and use of existing ones. Metaphors are an effective form of amateur modeling. When facing a novel situation, we take a leap of faith that a similar and known situation will serve as a useful map of the unexplored terrain. Having more metaphors at your fingertips increases the chances one of them will be a good map for the situation. But the ability to find this metaphor matters nearly as much as having it. We need a library that is large but also organized. Hofstadter and Sander argue metaphor selection is the real test of domain expertise. There are a lot of dimensions along which a metaphor can match the thing to be explained. I’ve written before that its the deep features that need to be matched, but there aren’t universal guidelines for differentiating a deep feature versus from a surface feature. Alchemists thought surface similarity to an egg was the important feature for proto-chemical work. That seems silly to us now, but I suspect that’s because we assume the world operates according to impersonal laws. If you believe the world is instead run by supernatural entities with a penchant for communicating revelations and other hidden knowledge to mankind, then any features with theological symbolism probably seems like the deepest ones of a problem. Nevermind that the number of the beast is 666 – Bacon’s Bible apparently had a typo – and that neither 666 nor 663 is equal to 693! In this era, those were not “deep features” of metaphorical similarity. Hofstadter and Sander essentially say practice and subtle skills determine how good an expert is at selecting the right metaphor. For many domains, that is surely correct. But I see two other tricks for organizing our library of metaphors. The first trick is unification. If we can subsume individual cases under more and more universal ones, then we reduce the number of metaphors we have to search through. We also reduce the risk that we overfit to a metaphor with many surface similarities. To stick with our metaphor of a metaphor library, this is like keeping one book from a shelf. For Hofstadter and Sander, this is essentially what categorization is. They give the example of the category mother emerging from a child’s encounter with more and more people who are somebody’s mother. Whereas the child may initially have to remember a large set of disconnected facts – Rachel is a mother, Sarah is a mother, Thomas is not a mother, Rebecca is not a mother, etc. – over time the category of mother emerges. When a new person is encountered, the child no longer has to mentally compare them one by one with Rachel, Sarah, Thomas, Rebecca and others. Instead, it can quickly fill in a lot of gaps in its knowledge about the person if it finds out she fits in the mother category. This is common in science, where models belong to the same family as metaphors (link). For example, many results in economics might initially be derived using a specific functional form. We might assume demand is given by the equation q = A – Bp, where p is a price and A and B are positive numbers. Or we might assume its given by q = A – Blogp or q = Ap^-B. This requires us to carry around all these different equations in our minds. Life is much simpler when we are able to generalize our result to any continuous function where demand is falling in price. You can see the same push for unification across most domains. It’s probably taken to its extreme in physics, where the quest for a single unified theory for the universe is taken to be a holy grail. From my outsider’s perspective (correct me if I’m wrong), historians seem to lie on the opposite end of the spectrum. In that field, detail matters. With unification, we sacrifice details but we hopefully get the big picture right. It’s usually worse to get the big picture wrong than to get the details wrong, and since unification helps us zero in on the right “big picture” metaphor, it’s valuable. But unification becomes a problem when the knowledge domain resists it. This can happen when the details matter. When you can’t subsume everything under one case, you have to organize the cases. It’s fairly common to organize metaphors into big categories and then leave it at that. I’ve done that myself, grouping the representations used by innovators into five categories: rules, probabalistic statements, metaphors, neural networks, and instantiations. But you can also create rigorous processes for sorting through these categories and pinpointing the right metaphor for a given situation. The best example of this that I know of is Dani Rodrik’s growth diagnostics. A bit of context is necessary to explain this. Rodrik is (among other things) a development economist. His growth diagnostics is a process for finding the correct economic model in that context. The problem development economists try to solve is why some national economies fail to grow at desired rates. Economic growth is a very complex and poorly understood phenomena, and there are many competing models of the process. Each of these models is a simplification, and each provides different kinds of policy advice . One might emphasize the rule of law and secure property rights, another investment in education, and a third subsidies for favored industries. Rodrik’s growth diagnostics helps you pinpoint the model most applicable to the setting. Access to a good model then allows you to think through what the impacts of various policies might be. Growth diagnostics is basically a decision tree (figure 2). 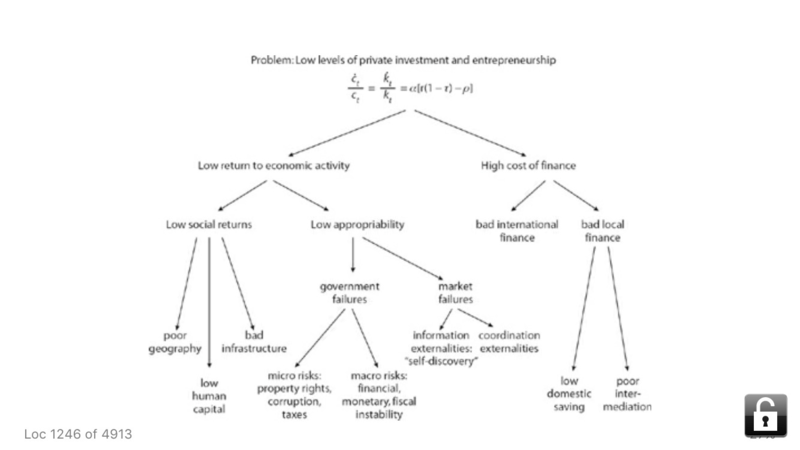 It starts at the top with the problem: insufficient private investment and entrepreneurship. Rodrik divides the possible causes of this into two categories: a low return to economic activity, or a high cost of finance. He then provides some suggestions for what kinds of evidence to look for to determine which is the case (e.g., “are interest rates low?”). Suppose we have decided there is a low return to economic activity. Moving down the tree, is the problem that there aren’t socially beneficial things to do (low social return), or merely that the private sector cannot find a way to make useful things profitable (low appropriability)? Again, Rodrik suggests specific things to look for to help you determine which branch of the tree you should descend to. Following the tree gets you down to a simple economic model of what is constraining growth. Economics has failed to discover a single model to explain everything, but with a procedure for finding the right model, it remains useful. It illustrates how a well-stocked library of metaphors can be made maximally useful whenc combined with a framework for zeroing in on the right one. Innovation, by definition, requires stepping out of the familiar and into the unknown. These sojourns go better for us when we have a map of the territory. Metaphors can serve this function; they assert the unknown is “like” the known. Having more of these maps is useful, because it’s more likely one of the maps is a good fit (link). But this is only true if we can find that map. Maps with too many details can lead us astray, because the details might fit really well but the big picture is off. If having more maps is going to be useful, we need to organize them. One way is to prune our collection to a small number of maps with only the most important details. The other is to create a meta-map over our maps: a process for determining the deep features of the situation and matching them to the corresponding metaphor. This entry was posted in Uncategorized on July 6, 2018 by mattsclancy.